Growing numbers of asylum seekers have traveled northward through the United States in recent months, in some cases under treacherous weather conditions to cross the border into their promised land: Canada. Images of African and Middle Eastern migrants trudging through snow drifts and braving icy rivers to cross undetected from the United States have ignited outcry among Canadian refugee advocates and politicians across the political spectrum. With an uptick in unauthorized crossers claiming asylum in border provinces across Canada, including a 230 percent increase in Quebec alone for January 2017 compared to a year earlier, some experts suggest the Trump administration’s announcements and rhetoric on immigration may be having the effect of sending some in search of asylum further north. More individuals are entering Canada illegally to avoid the provisions of the Canada-U.S. Safe Third Country Agreement (STCA). The treaty, signed in 2002, requires asylum seekers to apply for protection in the first country they enter, with a few exceptions. While its intended purpose was to streamline the processing of asylum seekers at border ports of entry, it has created a classic case of unintended consequences by incentivizing asylum seekers to illegally enter Canada instead of applying for protection at a port of entry, where they are likely to be returned to the United States. In light of increased illegal crossings in recent months, some members of the Canadian Parliament are calling for this loophole to be closed and for Canada—a country known for its openness toward refugees—to begin deporting unauthorized border crossers back to the United States. Meanwhile, Canadian refugee advocates argue that the United States is no longer a safe country of asylum and that Canada should suspend the agreement entirely. This article examines the STCA, its impact on unauthorized border crossings, and new pressures on the agreement. In the 1990s, Canadian officials expressed concern to U.S. counterparts about the duplicative nature of applying for asylum in North America. At that time, almost one-third of those seeking asylum in Canada entered from a U.S.-Canada land port of entry. Canada processed between 8,000 and 13,000 asylum claims at ports of entry yearly from 1995 to 2001; meanwhile, just 200 asylum seekers per year traveled in the opposite direction. Due to this largely one-sided flow, there was much discussion whether asylum seekers engaged in “forum shopping” between the two countries. The concern was that asylum seekers who did not qualify for or were denied asylum in the United States would then apply for protection in Canada. Following the September 11th attacks, the United States and Canada began a series of discussions to strengthen border security. As part of this larger conversation, they also discussed ways to streamline the processing of asylum claims at border ports of entry. The two countries began drafting a cooperative agreement in consultation with the United Nations High Commissioner for Refugees (UNHCR) to prevent asylum seekers from using the shared land border to access both asylum systems. The plan came to fruition in 2002, with signing of the Canada-U.S. Safe Third Country Agreement. Under the treaty, Canadian and U.S. officials at border ports of entry must return asylum seekers to the country of first presence, with exceptions for asylum seekers with a family member in the secondary country, unaccompanied children, individuals with valid travel documents, and those permitted entry on public-interest grounds. Even when an asylum seeker qualifies for an exception, he or she must also meet Canadian or U.S. admissibility standards to be permitted entry. While the agreement applies at border ports of entry and to asylum seekers entering either country by train, it does not apply to airport arrivals except in cases when the individual is attempting to enter Canada after being refused status and deported from the United States. Citizens of Canada and the United States are exempt, as are individuals allowed entry without a visa. Lastly—but importantly—the agreement does not apply to unauthorized border crossers apprehended by border officials. A key element underpinning the treaty is the designation of Canada and the United States as safe countries of asylum. Under international refugee law, signatories to the 1951 Refugee Convention and its 1967 Protocol must not forcibly return asylum seekers to a country where they would face the threat of persecution or bodily harm (known as the principle of nonrefoulement). The Refugee Convention, however, does not explicitly prohibit governments from entering into bilateral or multilateral agreements that allow parties to return asylum seekers to “safe third countries” for processing. The premise of the STCA is that when two countries offer “generous systems of refugee protection,” asylum seekers should obtain refugee protection in the first country that they are able to do so. The preamble of the STCA recognizes the United States and Canada as safe countries of asylum, establishing that as parties to the international refugee and human-rights treaties, both offer sufficient opportunities for asylum seekers to obtain effective refugee protection. As such, the STCA requires asylum seekers to apply for asylum in the country of first presence—the first country they enter. In November 2004, the U.S. government announced that the STCA would formally take effect on December 29. Immediately following the announcement, Canadian border officials experienced a surge of asylum seekers at border ports of entry. In December 2004, approximately 1,800 asylum seekers arrived in Buffalo, New York to cross into Canada, compared to the previous monthly average of 400, according to one report. The same month in nearby Fort Erie, Ontario, Canadian border officials received 55 claims per day on average for refugee status, nearly triple the prior average. After the agreement took effect, the number of asylum seekers applying at the Northern border drastically fell. In 2005, Canada received slightly more than 4,000 claims at border ports of entry, down from approximately 8,900 in 2004. The Canadian Council for Refugees found that the agreement had a disproportionate impact on Colombian asylum seekers: From January to November 2005, refugee claims submitted by Colombians fell by more than half. This was an early sign the agreement was working as intended, as almost all Colombian asylum seekers had first entered the United States before making their way to the Canadian border to apply for protection. Though the treaty appeared to be making asylum processing more efficient, refugee advocates in both countries have heavily criticized it. Many in Canada have argued that the United States should not be designated a safe third country as it is significantly harder to obtain protection there than in Canada. They note that asylum seekers in the United States face numerous barriers, including grant rates that vary widely by immigration court, high standards for evidence in asylum adjudications, lack of legal counsel, prolonged detention, and administrative barriers such as a one-year filing deadline. Canada also offers many more social assistance programs for asylum seekers, including temporary housing and health care. Because the STCA does not require that the United States and Canada establish uniform asylum procedures with similar benefits, refugee advocates say asylum seekers are more vulnerable to deportation when returned from Canada to the United States. In December 2005, the Canadian Council for Refugees along with several human-rights organizations filed a lawsuit in Canadian federal court challenging the legality of the treaty. In Canadian Council for Refugees et al. vs. Her Majesty the Queen, the plaintiffs asserted that the United States was not a safe country of asylum and that Canada was in violation of its international obligations under the Refugee Convention by returning asylum seekers to the United States. In 2007, Judge Michael Phelan ruled in favor of the plaintiffs, agreeing that Canada had violated its international legal obligations by entering into the agreement. However, the government appealed the decision to the Canadian Federal Court of Appeal, where it was overturned. The plaintiffs appealed to the Canadian Supreme Court, which refused to hear the case and no further legal proceedings have challenged the legality of the agreement. One significant unintended consequence of the STCA is that it incentivizes asylum seekers from the United States to illegally cross the border into Canada instead of presenting themselves at a port of entry. In the past several months, the flow of asylum seekers entering Canada from the United States has increased particularly dramatically. 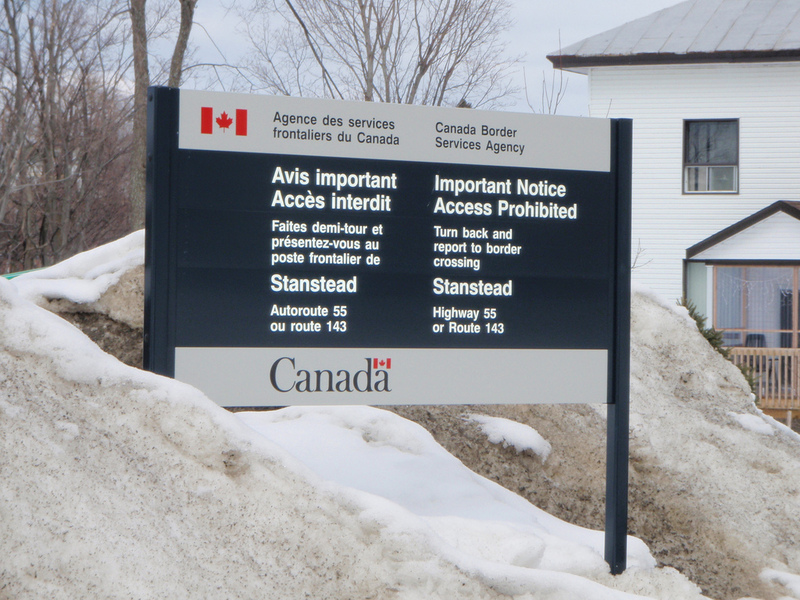 Between January and March, Canadian border officials apprehended 1,860 asylum seekers, with the highest number of border crossings taking place in Quebec, followed by Manitoba. Sources: Data for 2016 from Canada Border Services Agency (CBSA), as provided to Julie Masis, “Way More Migrants Are Now Sneaking across the U.S.-Canada Border,” Public Radio International, January 12, 2017, available online; data for 2017 from Immigration, Refugees, and Citizenship Canada (IRCC), “Asylum Claims and Interceptions: Monthly Report - Calendar Year 2017, RCMP Interceptions,” updated April 19, 2017, available online. Data from the Canada Border Services Agency (CBSA) also show that in just the first few months of 2017, the number of asylum claims submitted at land ports of entry is more than half the total number filed in 2016 (see Figure 2). * 2017 figure represents data for January through March. These numbers include asylum seekers apprehended by the Royal Canadian Mounted Police and brought to a port of entry processing. They do not include asylum claims made at inland IRCC offices. Sources: Government of Canada, “Asylum Claimants Processed by CBSA and IRCC Offices, January 2011-March 2017,” “Asylum Claimants Processed by CBSA Offices, January 2011 - March 2017: Land Ports of Entry,” accessed April 24, 2017, available online. Though it is still too early to conclusively rule on the cause of the recent surge in illegal border crossings, anecdotal evidence strongly suggests it is partially driven by growing fear among immigrant and refugee communities in the United States about the Trump administration’s immigration policies. This includes those who have already applied for asylum in the United States, some of whom are choosing to abandon those claims to apply for asylum in Canada—albeit by first entering the country illegally. Asylum seekers in the United States sometimes wait years for a final decision, and the sense of urgency to try and find asylum elsewhere may also be contributing to the increase in border crossings. Illegal border crossings place asylum seekers at greater risk of exploitation by human smugglers and other dangers. The roughly 4,000-mile U.S.-Canada border is made up of largely rugged terrain and is sparsely populated, meaning it can take several hours for border crossers to be identified and apprehended by border officials. This is particularly dangerous in the winter months, with reports of border crossers suffering frostbite, hypothermia, and other ailments from prolonged exposure. In February 2017, two asylum seekers who crossed into Manitoba suffered such severe frostbite that most of their fingers had to be amputated. To address some of the dangers of unauthorized crossings, an elaborate network has emerged in both countries consisting of border-town nonprofit organizations, faith-based groups, and volunteers who provide assistance to asylum seekers making the journey. This “underground railroad” stretches hundreds of miles north and south, providing border crossers with temporary housing, transportation, medical care, and advice on the challenges they will face. While such networks have helped to prevent migrant deaths along the U.S.-Canada border, the act of crossing illegally remains dangerous. In light of the recent increase in unauthorized border crossings, Canadian policymakers have signaled they are re-examining the effectiveness of the treaty in managing flows along the border. Conservative members of Parliament are pressing for the STCA to be amended to prevent unauthorized border crossers from filing refugee claims in Canada. Unauthorized border crossers should not be granted access to the Canadian asylum system, they argue, and instead should be immediately deported back to the United States. Although Canadian Prime Minister Justin Trudeau has vowed to keep Canada an “open country,” a recent poll found that nearly half of Canadians would support the immediate return of unauthorized border crossers to the United States. This may represent a sign of growing public concern about Canada’s ability to effectively secure its southern border. Nevertheless, Canadian refugee advocates, liberal policymakers, and civil-society organizations are pushing back against calls for ramped-up border security. Instead, they argue that the treaty should be suspended to allow asylum seekers to formally apply for protection at border ports of entry. In February 2017, hundreds of law professors across Canada submitted a letter to the Minister of Immigration, Refugees, and Citizenship calling for an immediate suspension of the treaty. In the letter, they contended that Trump administration executive orders banning the entry of nationals from six predominantly Muslim countries violated a number of international refugee and human-rights treaties. As such, the United States is no longer a safe third country for asylum seekers, they claimed, and Canada is in violation of its international legal obligations by returning asylum seekers to an unsafe country. Advocates are echoing these concerns. “If [the United States] is willing to close the door in such a dramatic way, institute discrimination on the basis of religion, and identify certain nationalities that are excluded totally, it’s not reasonable to expect that that country is going to respect its obligations under international law towards the refugees you send back,” said Janet Dench of the Canadian Council for Refugees. If unauthorized border crossings continue to increase, Canada will face growing calls for stronger border security measures while also garnering pressure from refugee advocates to retain sufficient access to protection for asylum seekers. As Canada faces both internal and external pressures on immigration, time will tell whether it retains its significant focus on welcoming newcomers or instead begins to shift gradually toward increased border controls to limit who can enter and, perhaps more importantly, who can remain. Arbel, Efrat. 2013. Shifting Borders and the Boundaries of Rights: Examining the Safe Third Country Agreement between Canada and the United States. International Journal of Refugee Law 25 (1): 65-86. Canadian Council for Refugees. 2005. Closing the Front Door on Refugees: Report on the First Year of the Safe Third Country Agreement. Montreal: Canadian Council for Refugees. Available online. CNN. 2001. U.S., Canada Sign ‘Smart Border’ Declaration. CNN, December 13, 2001. Available online. Freeman, Alan. 2017. ‘Build That Wall?’ Some Canadians Are Calling for More Border Control, Too. The Washington Post, March 30, 2017. Available online. Government of Canada. 2017. Asylum Claims and Interceptions, Monthly Report - Calendar Year 2017. Updated April 19, 2017. Available online. ---. 2017. Asylum Claimants Processed by Canada Border Services Agency (CBSA) and Immigration, Refugees and Citizenship Canada (IRCC) Offices, January 2011 - March 2017. Updated April 19, 2017. Available online. Halpern, Jake. 2017. The Underground Railroad for Refugees. The New Yorker, March 13, 2017. Available online. Harvard Law Student Advocates for Human Rights, International Human Rights Clinic, Human Rights Program, and Harvard Immigration and Refugee Clinical Program. 2006. Bordering on Failure: The U.S.-Canada Safe Third Country Agreement Fifteen Months After Implementation. Cambridge, MA: Harvard Law School. Available online. Hopkins, Andrea. 2017. Canada PM: Will Not Halt Illegal Border Crossing Despite Opposition. Reuters, February 21, 2017. Available online. Immigration, Refugees, and Citizenship Canada. 2004. Safe Third Country Agreement Comes Into Force Today. News release, December 29, 2004. Available online. ---. 2016. Canada-U.S. Safe Third Country Agreement. Updated June 23, 2016. Available online. Khandaker, Tamara. 2017. Under Pressure: Following Trump’s Immigration Crackdown, Canada Urged to Scrap a US Border Agreement that Forces Refugees Underground. Vice News Canada, January 28, 2017. Available online. ---. 2017. No Entry: Canada Won’t Scrap a Border Agreement that Blocks Asylum Seekers Coming through from the U.S. Vice News Canada, February 2, 2017. Available online. Krauss, Clifford and Robert Pear. 2004. Refugees Rush to Canada to Beat an Asylum Deadline. The New York Times, December 28, 2004. Available online. Langlois, Joe. 2002. Testimony of Director, Office of Asylum, U.S. Immigration and Naturalization Service, before the House Judiciary Committee, Subcommittee on Immigration, Border Security, and Claims. United States and Canada Safe Third Country Agreement. 107th Cong., 2nd sess., October 16, 2002. Available online. Langerquist, Jeff. 2017. Canadian Law Professors Say U.S. No Longer Safe for Refugees. CTV News, January 31, 2017. Available online. Ljunggren, David and Rod Nickel. 2017. Almost Half of Canadians Want Refugees Illegally Crossing into Canada Deported: Poll. Global News, March 20, 2017. Available online. Masis, Julie. 2017. Way More Migrants Are Now Sneaking across the U.S.-Canada Border. Public Radio International, January 12, 2017. Available online. Murphy, Jessica. 2017. Crossing the Border: US Migrants Seek Refugee Status in Canada. BBC, February 13, 2017. Available online. Reuters. 2017. Poll: Half of Canadians Want Asylum Seekers Who Illegally Cross U.S. Border Deported. Reuters, March 30, 2017. Available online. Ryan, Kelly. 2002. Testimony of Deputy Assistant Secretary, Bureau of Population, Refugees, and Migration, Department of State, before the House Judiciary Committee, Subcommittee on Immigration, Border Security, and Claims. United States and Canada Safe Third Country Agreement. 107th Cong., 2nd sess., October 16, 2002. Available online. Settlage Gonzales, Rachel. 2013. Indirect Refoulement: Challenging Canada’s Participation in the Canada-United States Safe Third Country Agreement. Wisconsin International Law Journal 30 (1): 142-89. United Nations High Commissioner for Refugees (UNHCR). 2006. Monitoring Report: Canada-United States “Safe Third Country” Agreement. Geneva: UNHCR. Available online. White House, Office of the Press Secretary. 2002. Summary of Smart Border Action Plan Status. News release, September 9, 2002. Available online.